The North Carolina Coastal Federation and partnering agencies wrapped up a two-year project which removed almost 600,000 pounds of debris from Carteret County waters. The debris from a decades-old mariculture operation was causing navigational hazards and littering coastal habitats. 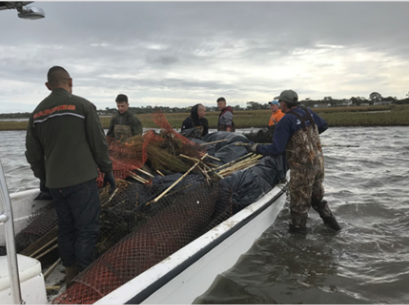 According to a press release from the North Carolina Coastal Federation, volunteers, NOAA partners, and a local contractor removed pilings, plastic cages, buoys, netting, piping, and other debris from the site near Harker's Island. A research group with Duke University used marine robotics to locate hard to spot debris and studied how the marsh recovered after the cleanup. In addition to debris removal, the project aided the development of best management practices for the shellfish mariculture industry by identifying effective ways to prevent and reduce debris from mariculture operations.